Following is a detailed description of my chance operation game piece I will be presenting at CageFest, a week long celebration of the ideas of John Cage. This performance will be on March 24th at the CoRK Arts District in Jacksonville. It will be part of the all day event titled Circus of Happening: A Chance-Determined Series of Arranged Convergence. Milton Bradley (2012) is a chance operation piece based on the structure and advancement techniques used in family board games. The full description of the operation is “chance operation within finite parameters using board game mechanics resulting in instant compositions.” Rules and parameters are followed in order much the same way as board game participation. Participants are positioned around a table. Before commencement, the players have selected three instruments and placed each in separate groups, Blue, Red, or Yellow, with Blue being their primary instrument. The first player to take their turn spins the dial. The dial will determine the number of participants to play on this particular piece. The spinner will land on either solo, duo, trio, quartet, leader decides, high roller decides, exquisite corpse, or blinder quartet. Solo, duo, trio, and quartet are self-explanatory and the participants are chosen by the leader, or player in charge. Leader decides: the player in charge determines how many and who is playing that piece. High roller decides: The remaining players roll an eight sided die. The player with the highest number rolled will determine the participants. Exquisite corpse: All players will perform but will play one at a time, beginning with the leader, moving right to left. Each player will continue from the previous players end point, which will be random and determined by the players themselves. Blinder quartet: All players will participate and will play over each other, disregarding anything the others are playing. The leader rolls large die to determine length of piece, from one to six minutes. The leader draws a card from the deck to determine the interpretation. This may be either a style description, a photograph, a drawing, an emotion, a situation, or the interpretation of a graphic score. The interpretation of the card is completely up to the leader of the piece and any instructions to the participants is allowed. If a graphic score card is drawn, the graphic score will be projected behind the participants and will also display on a laptop on the table. The graphic score can be divided up, sectioned, and designated by the leader in any way they wish. Finally, the leader will select a color tile from the grab bag. This will determine instrumentation. Green: leaders choice. Leader will select the instrumentation for participants. Black: participants will select their own instruments to play in the piece. Timer will be set for the minutes determined in step 2. When leader is ready to begin he/she will begin the timer. Buzzer will designate the end of the piece. Player to the right will be the next leader. Milton Bradley (Nov. 8, 1836-May 30, 1911) worked as a draftsman, patent agent, and lithographer, and owned the first color lithography shop in Massachusetts. 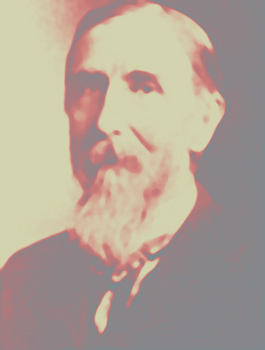 An American game pioneer, Milton Bradley was credited by many with launching the board game industry in North America. Struggling to find a new way to use his lithography machine, Bradley visited his friend George Tapley. Tapley challenged him to a game, most likely an old English game. From this encounter, Bradley conceived the idea of making a purely American game. He created “The Checkered Game of Life”, which had players move along a track from Infancy to Happy Old Age, in which the point was to avoid Ruin and reach Happy Old Age. Squares were labeled with social/moral positions from honor and bravery to disgrace and ruin. Players used a spinner instead of dice because of the negative association with gambling. Introduced in 1860 and considered to be the first “family board game”, The Checkered Game of Life was an instant success. In 1864 Bradley and his business partners formed Milton Bradley & Company. He bought out his partners in 1878, and re-named the business the Milton Bradley Company. Since Bradley’s death in 1911, the business he founded has introduced such enjoyable diversions as Battleship in 1931, Chutes and Ladders in 1943, Yahtzee in 1956, Operation in 1965, Twister in 1966, and Connect Four in 1975. To celebrate the company’s centennial, Bradley’s original game was re-designed and re-introduced, its name shortened to The Game of Life, in 1960. The Milton Bradley Company became a subsidiary of Hasbro in 1984, and Parcheesi and Scrabble became Milton Bradley games after being purchased by Hasbro in 1989.